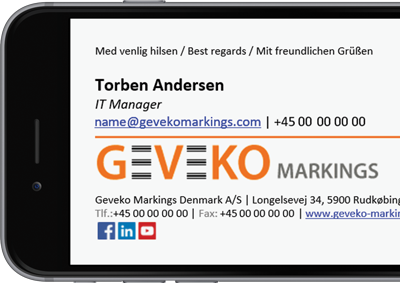 Geveko Markings needed a solution to manage Office 365 signatures for users’ based in multiple locations. See why they chose Exclaimer Cloud - Signatures for Office 365. Geveko Markings is a leading manufacturer and supplier of materials for road markings, line markings and horizontal decoration in the world. The company has a full range of products including cold plastic, thermoplastic, water borne paint and preformed thermoplastic markings. Exclaimer Cloud - Signatures for Office 365 ensures an email signature is applied, no matter what device you’re using. For companies that have multiple office locations or a travelling workforce, being able to control email signatures for all users in one central location is essential. Geveko Markings has multiple offices and production plants located around the world, with sales representatives in 19 countries, making it difficult to manually control Office 365 signatures.